Non zero-emission vehicles will be banned from six streets in Oxford center. LONDON -- The university city of Oxford has unveiled plans to ban gasoline and diesel cars from its center as part of the most radical set of proposals so far in Britain to curb pollution. 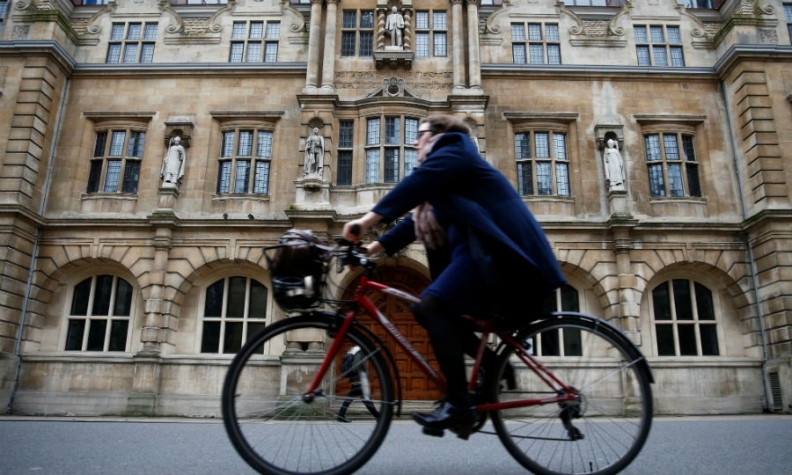 Oxford's "Zero Emission Zone" will ban combustion engine vehicles from entering part of the city center starting in 2020. "All of us who drive or use petrol or diesel vehicles through Oxford are contributing to the city’s toxic air," said city council board member John Tanner. "Everyone needs to do their bit – from national government and local authorities to businesses and residents – to end this public health emergency." In the first stage of its plans, taxis, cars, light commercial vehicles and buses which are non zero-emission, will be banned from six streets in the city center, including near the world-famous Oxford Union debating society. The zone will be gradually widened to include more streets and further vehicle types until 2035 when all emitting vehicles, including lorries, will be banned from the center. Britain has said it will ban the sale of new diesel and gasoline cars from 2040, replicating plans by France and the mayors of Paris, Madrid, Mexico City and Athens, who aim to ban diesel vehicles from their city centers by 2025. London is rolling out an "ultra low emission zone," which will see the most gas-guzzling vehicles pay daily charges to enter the city center starting in 2020.